Etienne Tshisekedi (wa Mulumba) was a statesman of the opposition in the Democratic Republic of Congo. He built and presided over the party of opposition, Union for Democracy and Social Progress (UDPS: Union pour la Démocratie et le Progrès Social). He was the prime minister of Zaire under Joseph-Désiré Mobutu (Mobutu Sese Seko Kuku Ngbendu wa Za Banga) a bit more than one month in 1991, three months in 1992, and eight days in April 1997. 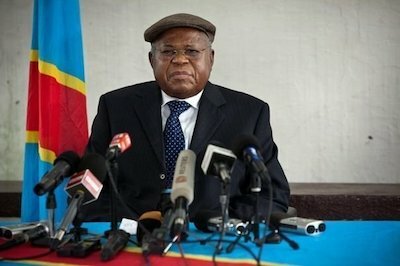 Etienne Tshisekedi (wa Mulumba) was born on 14 December 1932 in Luluabourg in the Belgium Congo (now the Democratic Republic of the Congo). Tshisekedi grew up in a modest family. In 1960 the year the Belgium Congo became independent, he was twenty-eight. In the same year, he became the first Congolese student in his country to graduate from law school. Five years later, he began his career in government in 1965 when General Joseph-Désiré Mobutu took over the country and renamed it Zaïre. President Mobutu ruled Zaire from 1965 until he was ousted in 1997. In 1965 Tshisekedi accepted the post of Interior Ministry in the Mobutu administration. He helped rewrite Congo’s constitution in 1967, which was ratified in 1970 in order to support the new regime and its unique party authorization. During these years, he did not oppose the political repression happening in Zaire, including the murder of Patrice Lumumba (the first head of government of independent Congo) on 17January 1961. Nor did he fight repression or executions such as the hanging of the Pentecost’s Martyrs in 1966 because of their politics. At the beginning of the 1980s, Tshisekedi became an opponent of President Mobutu. He resigned from the government and signed an open letter with other deputies, criticizing the absence of democracy, the personalization of the power made by Mobutu, and the interdiction of opposition parties. This letter, published on 1November 1980, helped initiate the UDPS (Union for Democracy and Social Progress), which soon became the main opposition party in Zaire. Tshisekedi’s actions caused him to face the possibility of arrest and incarceration by the Mobutu government. In the face of growing political crisis and instability in Zaire, Mobutu designated Tshisekedi prime minister twice in order to win over opponents. Tshisekedi served as prime minister a bit more than one month in 1991 and three months in 1992. He also served as Prime Minister in the last few days of Mobutu’s rule in April 1997. The revolutionary forces under Laurent-Désiré Kabila that took power in Kinshasa in May 1997 ended Mobutu’s rule and almost immediately renamed Zaire the Democratic Republic of Congo. After this change, Tshisekedi remained in the opposition now against the new ruler, Laurent-Désiré Kabila (father) and his son and successor, Joseph Kabila until 2014 when illness forced him to stop his political activities. Etienne Tshisekedi died on February 1, 2017 at eighty-four years in a hospital in Brussels, Belgium, because of a pulmonary embolism. “ L’opposant congolais Etienne Tshisekedi appartient désormais à l’Histoire » http://www.lemonde.fr/afrique/article/2017/02/01/etienne-tshisekedi-l-opposant-historique-de-rdc-est-mort_5073043_3212.html; Dieudonné Ilunga Mpunga, Étienne Tshisekedi : le sens d'un combat, (Paris : l'Harmattan, 2007) ; Évariste Tshimanga Bakadiababu, Tshisekedi ou Le combat pertinent pour libérer le Congo-Zaïre ? : questions à l'UDPS, (Paris : l'Harmattan, 2006). l’UDPS, (Paris : l’Harmattan, 2006).